Turns out those Gold Points you get for registering Switch games expire after a year. At least Nintendo had the good grace to tell me. So: what can I get with £1.16? Well, it changes pretty frequently, because it’s mostly games with massive discounts on a usual price of a few quid. When I spent my pence the only real bargain was King Oddball, down to £0.99 with 75% off. 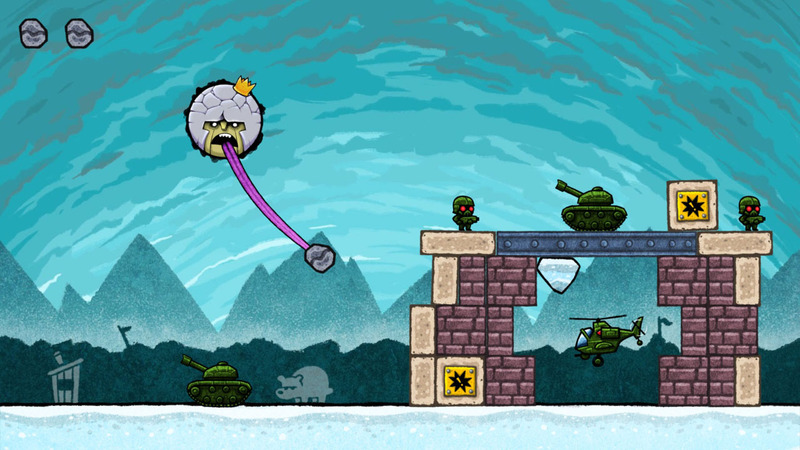 It’s a physics puzzler where you lob boulders with the titular king’s tongue. It looks a bit Angry Birds, and reviews are pretty positive. But no, that didn’t get my pence. At its regular price of £1.09 it was within budget, but even an additional 17% off to £0.90 couldn’t tempt me to go for Swap This!, which is a pretty unimaginative title for a tile swapping game. Again, reviews are fine, but Zoo Keeper has a special place in my heart and I’m not unfaithful to it lightly. Neither did Bouncy Bob convince me, a one-button sort-of-platformer with a regular price of £0.89 and a smattering of unenthusiastic reviews. No, the recipient of my precious unearned pence was SKYPEACE, just £0.89 at full price. Why? Well, it’s not a conversion of a mobile or PC game for one thing. No, it’s a conversion of a 2014 3DS game! Which for some reason is a plus. But mainly because it actually looked quite slick – and it is. The anime-style title screen is very nice, and the basic pixel graphics are stylish, bright and colourful. And quick – which makes it all a bit hard going on a big screen – it’s the sort of thing liable to make your eyes bleed. But in portable mode – closer to its 3DS origins – it’s all very nice. It’s essentially an endless runner, though it looks and feels a lot like a horizontal scrolling shoot ’em up without the shooting – all you can do is move into one of nine positions in a grid at the left of the screen, to avoid the carnage that comes at you. There are ten levels, which are long enough to get that I hope it ends soon or I’m going to die feeling, but short enough not to be frustrating when you do. They get noticeably harder, though only by the last couple was I actually failing to get through first time without dying. 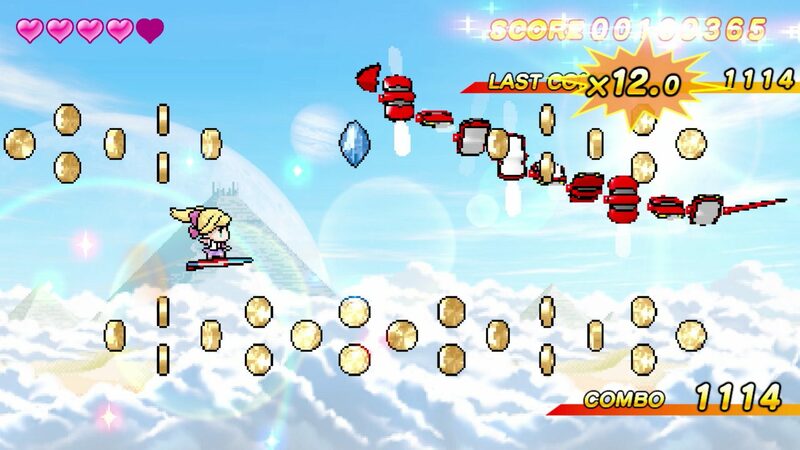 The last level in particular throws all the enemies you’ve seen before at you in a most enjoyable test of keeping an eye on everything at once. It’s not desperately tricky, but there’s a nice little sense of progression from understanding how to avoid each variety and using that knowledge in combination. After that it’s high score chasing, if that’s your thing, or a series of achievements to earn. ‘Decent Player’ is one of the achievements, which I took as a very pleasant compliment. 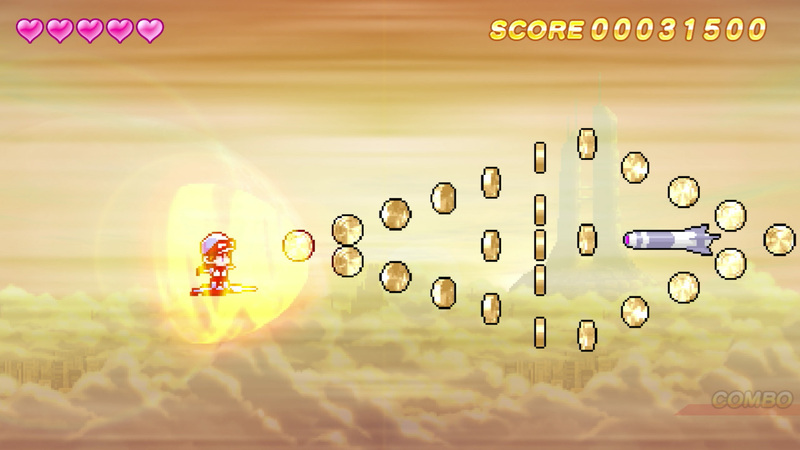 And you’re a decent game, SKYPEACE, even with your all-capitals title.